Between 1992 and 2000, we were able to make, in the Federation of Workers of the Metallurgists Industry of the State of São Paulo, important programs of formation and professional qualification of trade union leaders, and employed and unemployed workers. Thousands of people passed by the school benches of the Federation, and the 54 trade unions affiliated to our entity. It is very important, once the biggest knowledge of the leader, better his actuation in defense of workers’ rights and wills. Besides, the obligations of the trade union entities, nowadays the society demands the participation of workers in the direct and indirect administration of the State. To participate of the Councils of the Guarantee Fund for Time of Service and the Fund of Support for Workers, the leader has to have specific formation and a good level of politic, economic and social knowledge. In addition, not only workers have to win: all the society gains with the qualification of trade union leaders. 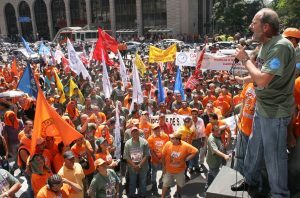 Although in these twenty years, we have achieved some advances in this area, the action of the trade unions, federations and confederations and centers falls short. Generally, the financial resources of these entities are directed to other activities that not the qualification. I believe that there is some fear of many of the current leaders of being overcome by the new companions and because of this; they do not invest in the basis formation. The leaders that appeared in that time reflected the subjective and objective context in which they lived. They are companions’ men and women who were formed in the heat of the fight for the reposition of inflation and recuperation of the wage valorization, and they gained the respect of workers. We claimed, that time, about 100%, 200% of increase. The economic stabilization and the globalization of economy passed to demand another kind of leader. They started to demand leaders able to get from the bosses, beyond wage gain, social claims, as better conditions of work, food help professional qualification and requalification. The current situation is different. It is not so fierce, but the leader has to be up to date with the demands of the world around him. We are ministering the course of Capacitation of Trade Union Leaders of Basis – in the trade unions of Araras, Ourinhos, Franca, Cruzeiro, Espírito Santo do Pinhal, Fernandópolis, Piracicaba, Tatuí, Embu-Guaçu, Artur Nogueira, Cerquilho, Marília, Ribeirão Preto, São José do Rio Preto e Mogi-Guaçu – in the head office of the entity, in the Capital of São Paulo. The debates are around essential themes for the labor fight. Among other theme, the leaders discuss the history of the trade union movement, trade union structure and basic notions of economy. We have a policy of permanent formation of leaders, to extend our actuation in the basis and strengthen, this way, our trade union fights. By our prevision, until the end of 2011, about three hundred leaders will have passed through our benches of our Federation. The Federation is connected – and always look for being up to date – in the virtual world and the current social nets. An arm can help a lot in the qualification and formation of trade union leaders. In addition, the trade union entities have known well the digital toes to extend and release its actions, just as to foment dialogues and debates. The Internet is a powerful instrument of mobilization and represents a more way to lead information and promote the interchange among the trade union movement and the other sectors of society.